Cuernavaca ( kweɾnaˈβaka ; Classical Nahuatl: Cuauhnāhuac [kʷawˈnaːwak] "near the woods", modern Nahuatl pronunciation ) is the capital and largest city of the state of Morelos in Mexico. It was established by the Olmec, "the mother culture" of Mesoamerica, approximately 3,200 years ago and is designated as the archaeological site of Gualupita I . The city is located south of Mexico City, from which it may be reached after a drive of approximately 1½ hours using the D-95 Freeway. Cuernavaca was designated a Forest Protection Zone by President Lazaro Cardenas in the 1930s to protect the aquifers, the vegetation and the quality of life of residents both in Mexico City and locally. The city was nicknamed the "City of Eternal Spring" by Alexander von Humboldt in the 19th century. It has long been a favorite escape for Mexico City and foreign visitors because of this warm, stable climate and abundant vegetation. Aztec emperors had summer residences there, and today many famous people as well as Mexico City residents maintain homes there. 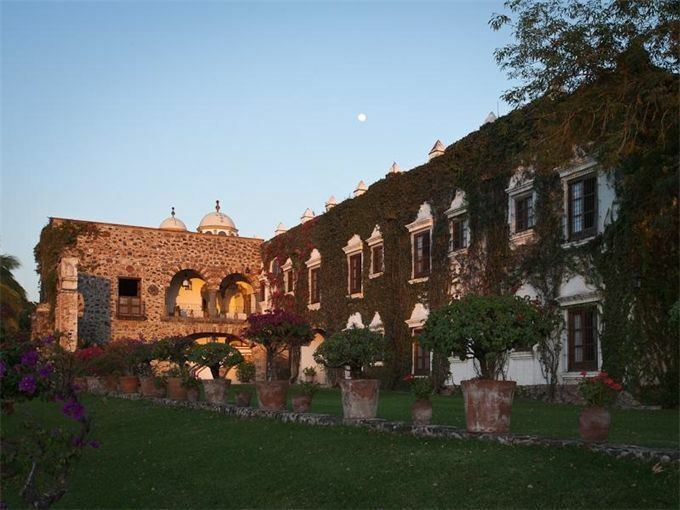 Considering its location of just a 1½-hour drive from Mexico City, Cuernavaca traditionally has been a center of Mexican society and glamour, with many of the country's wealthy citizens owning sprawling mansions and haciendas in this cultural haven. Cuernavaca is also host to a large foreign resident population, including large numbers of students who come to study the Spanish language. Cuernavaca was nicknamed "city of eternal spring" by Alexander von Humboldt in the 19th century. The city is located in a tropical region, but its temperature is kept fairly constant in the 70s (°F). It is located on the southern slope of the Sierra de Chichinautzin mountains. In the morning, warm air flows up the mountains from the valley below and in the late afternoon, cooler air flows down from the higher elevations. A ubiquitous flowering plant in the city is the bougainvillea. This pleasant climate has attracted royalty and nobles since Aztec times. Most of the Aztec emperors called Cuernavaca their summer residence. Foreign princes, archdukes and other nobles have been attracted to this place because of its flowers, sun, fruits, fresh-water springs and waterfalls. Emperor Maximilian I of Mexico set up a country residence in the city. Philanthropist Barbara Hutton, who held several royal titles through marriage, had a home in the city. The Shah of Iran, Mohammad Reza Pahlavi, lived in exile in the city following the Iranian Revolution. Although a native of the U.S., Bauhaus designer Michael van Beuren established his residence in a family hacienda in Cuernavaca while fleeing the rise of the Nazi regime in Germany (where he studied and practiced his profession), and a colony of Bauhaus designers grew in the city during World War II. Cuernavaca always has been a popular place for people from Mexico City to escape the city. In the 20th century, the climate and flora began to attract many foreigners as well. Population increase in this urban area began in 1940, but the metro area was not created, nor recognized, until the 1960s. From this time the population and the extension of the metropolitan area has grown. From 1960 to 1980, the population had grown from 85,620 to 368,166. From the 1980s to the present, the municipalities of Emiliano Zapata, Jiutepec, Temixco, Tepoztlán, Xochitepec, and Yautepec have been added to the metropolitan area. These municipalities have seen the highest rates of growth, however, population and economic activity remains concentrated in the city of Cuernavaca proper. As of 2005, the metropolitan area had a population of 802,371, with 349,102, living in the city proper. The first incursions south into the area by peoples of the Valley of Mexico occurred in the 12th century, when a lord named Xolotl (ruler of Tetzcoco) conquered most of the Valley of Mexico. An allied Chichimeca tribe also moved south into what is now northern Morelos state, making Techintecuitla lord of the Cuernavaca area, with the Tlahuicas concentrated in the nearby towns of Yecapixtla and Yautecatle. According to the Tlatelolco Annals, in 1365, the lord of Cuernavaca, Macuilxochitl, tried to conquer lands as far as the Valley of Mexico, but was met by the lord of Chalco, Tzalcualtitlan, with similar ambitions. Cortés returned to Cuernavaca in 1523, stopping in Tlaltenango, where he founded the Church of San José and constructed the first sugar plantation. The fertility of these lands compelled the conquistador to found his favorite residence here. Juana de Zúñiga, Cortes's wife, lived in Cuernavaca in the palace that was constructed in 1526. Cortes then moved the hacienda in Tlaltenango to Amatitlan and finally settled in his hacienda at Atlacomulco. The Franciscans arrived in Cuernavaca in 1529 and founded their 5th monastery in New Spain there. This first group included Martín de Lua, Francisco Martínez, Luis Ortiz, Juan de Cervo, Francisco de Soto, Andrés de Córdova, Martín de Jesús, Juan Juárez, Juan de Motolinía, and Juan García de Cervo. Originally they lived at the San Francisquito hermitage, but later they constructed the open-air chapel, Capilla Abierta, at the Church of San José in Tlaltenango. They extended their presence into the neighboring communities of Tetecala, Jiutepec, and Tlaquiltenango, among others, eventually forming the province of Santo Evangelio, which would be part of the province of Mexico in 1543. In 1646, this province was reorganized several times. Cuernavaca and Cuautla became high mayorships which answered directly to the viceregal authorities in Mexico City. In 1786, New Spain was divided into twelve provinces and in 1824, Cuernavaca was initially a district of Mexico City. In the first decades of the 20th century, Cuernavaca became a place to vacation and gamble when the Hotel de la Selva was converted into the Casino de la Selva, which attracted people such as Rita Hayworth, Bugsy Siegel, and Al Capone to Cuernavaca, however, gambling was shut down by Lázaro Cárdenas in 1934. He is the same president who declared the area a ZPG (Forest Protection Zone). The casino hosted very important artistic works, including murals of Alvarez Icaza, Messeguer, and the architecture of Candela. The main vault was considered to be the "Mexican Sistine Chapel" by Nobel Prize author, Gabriel García Márquez. 1936 was the year that Malcolm Lowry wrote his short story, "Under The Volcano", which inspired his 1947 novel of the same name. It is still considered one of the top five greatest novels of the twentieth century, and has never gone out of print. Cuernavaca, or Quaunahuac, as it is called in the novel, and the surrounding area, figure prominently in this great historical novel, where extensive details on Mexican history, culture, topography, and especially, politics and religion figure prominently. The recurrent artifacts are the twin volcanos, Popocatepetl and Iztaccihuatl, and the barranca, symbols of division, death, and rebirth in the city of eternal spring. The Frente Civico received the 2004 National Mendez Arceo Human Rights Award for having protected the world cultural heritage found in the city. The Juárez and Morelos Gardens are in the center of the city, both of which are plazas lined with trees. Between the two is the State Government Palace, a three story building with a tezontle façade built between 1955 and 1969. The Morelos Garden dates from 1908 and is easily recognizable by the large stone statue of José María Morelos, which is known colloquially as "Morelotes". The Juárez Garden is located to the north of the State Government Palace and is the oldest public square in Cuernavaca. The Garden contains a kiosk from Britain dating from the end of the 19th century. Unlike most main squares in Mexico, neither of these open up the way to the main cathedral. The main cathedral in Cuernavaca is located a few blocks west of the square. The cathedral was built by Cortés to double as a fortress, with cannons mounted above the buttresses. Over time, this church underwent a number of transformations, updating its interior. This was undone in the mid-20th century, when restoration work removed all the Neoclassical altars and images. These now are stored in the cathedral's pinacotheca and not available to the public. Restoration work uncovered al fresco murals on the lateral walls, relating to the martyrdom of Philip of Jesus, the first Mexican canonized as a saint. The only other decoration inside this church now is a modern-style crucifix and an image of the Assumption of Mary. This restoration work was carried out by Bishop Sergio Méndz Arceo. The main entrance is on Hidalgo Street, where one passes between two large chapels called the Chapel of Santa Cruz and the Chapel of the Tercera Orden. The Tercera Orden is considered to be the more valuable artistically of the two, with its highly sculpted early Baroque main and side portals painted in various colors. Inside, there is a later Churrigueresque main altar. A third chapel, called the Chapel of Nuestra Señora de los Dolores is farther into the atrium and near the Open Chapel of San José. Teopanzolco is an archeological site located just east of the historic downtown of Cuernavaca. Its construction is dated to the year 1427, and it was an important ceremonial center during the 15th and 16th centuries when the native Tlahuicas were dominated by the Aztecs. The site shows significant Aztec influence. It has a large pyramidal base, called the Gran Basamento, topped by two shrines, much like the Templo Mayor in Tenochtitlan. Only the stone columns of these shrines remain today. The teocalli, or sacred plaza, contains fourteen monuments including a circular altar dedicated to the wind deity Ehécatl. There are also two concentric structures separated by a moat or ditch. Both might have been dedicated to Quetzalcoatl, the feathered-serpent deity. The Borda Garden is located near the cathedral on Morelos Street. Originally, this was a house bought by José de la Borda, the mining magnate of Taxco in the mid-18th century. Later, his son, Manuel de Borda y Verdugo, transformed the grounds of the house into gardens filled with flower and fruit trees to satisfy his passion for botany. These gardens also contain a number of fountains and an artificial lake that were completed in 1783. The complex also contains lodgings, offices, a restaurant, and a nightclub. In 1865, this was the summer home of Emperor Maximilian I and his wife Carlota Amalia. It hosted major political soirées in the 19th and 20th centuries, such as those sponsored by Porfirio Díaz and Emiliano Zapata. Today the area is a public park where the gardens have been maintained and it is possible to take a short boat ride on the lake. The house has been converted into a museum. Six of its halls are dedicated to temporary exhibits while the other seven are devoted to recreating the characteristics of the 18th and 19th centuries. The Church of Nuestra Señora de Guadalupe is located next to the Borda Garden, and was constructed by Manuel de la Borda in 1784. It has a Baroque façade and what is considered to be the best cupola in the city. It was the royal chapel of Emperor Maximilian. Museo de Fotografía Antigua, also known as El Castillito (the little castle), is located one block from the Chapitel del Calvario. It is a very small brick building that dates from the late 19th or early 20th century. It is now a small museum dedicated to antique photographs of the city of Cuernavaca. The Salto de San Anton is a large ravine with a small waterfall that is located within the city limits of Cuernavaca. The waterfall is 36 metres (118 feet) high, with its water coming from a small tributary of the Zempoala River. The vertical walls of the ravine are of basalt and broad-leafed vegetation grows in nooks and crannies of the stone. A series of stairs and platforms have been built to enable access to the waterfall area from the park above. Unfortunately, a lot of trash gets dumped there. The Sala de Arte Público Siqueiros is a museum and research center, but is also hosts countless of lectures and panel discussions on contemporary art. The SAPS is dedicated to give continuity to the technical and thematic concerns of the muralist in relation to contemporary art. The SAPS promotes the legacy of Siqueiros. In recent years, the murals at the SAPS were restored. While, more than 80,000 documents and materials were digitized. Also, the institution was renovated, which changed the façade and bookstore. Cuernavaca has been a getaway, especially for the well-to-do, since Aztec times. This has continued to the 21st century, with many of these residents including artists, intellectuals, and film stars. For example, María Félix, a Mexican diva, had an opulent, cobalt-blue and papaya-colored villa on Avendia Palmira, along with five other houses. It is known as the Casa de las Tortugas (House of the Turtles) and has Louis XV beds, is adorned with silk brocades, Venetian mosaics, talavera urns, marble fireplaces, sixteenth-century Spanish armor, Italian gilded chairs, and portraits of her created by Antoine Tzapoff. The legalization of gambling for a short time in the 1930s attracted Hollywood visitors such as Rita Hayworth and Mafia figures such as Bugsy Siegel and Al Capone from the United States. Cuernavaca was the setting of Malcolm Lowry's Under the Volcano written in 1947. It is a tale of despair and self-destruction due to alcoholism. In the 1950s and 1960s, the city attracted many directors, producers, and actors from Hollywood, many of whom had been blacklisted through the influence of McCarthyism. Cuernavaca became the host of the CIDOC (Centro Intercultural de Documentación) in 1961, a Catholic institution that indoctrinated priests from developed countries before they were deployed elsewhere in Latin America. CIDOC's lasting reputation was assured by its founding director Ivan Illich, though it closed, "a victim of its own success", ten years later under right-wing political pressure. In the 1960s, the city became one of the centers of the psychedelic movement, attracting many artists, composers, and hippies. Another infamous resident was Sam "Momo" Giancana, a mafia boss from Chicago, who made Cuernavaca his home from 1967 until his arrest and deportation in 1974. He was associated with the Saint Valentine's Day Massacre. Many of these foreign residents, famous or not, first come as visitors, but then decide to stay. Gene Gauntier, actress and scenarist of silent film, spent the rest of her life in Cuernavaca. She lived in her sister's home, Marguerite Wenner-Gren, wife of Swedish millionaire Axel Wenner-Gren who owned an hacienda Rancho Cortès (today Hotel Racquet). Gauntier died in 1966. The trend continues today, with a large number of retirees, diplomats, business executives, and government officials living in Cuernavaca from all over the world. It still attracts creative and intellectual people. Many of these foreign residents have formed active expatriate groups, such as the Cuernavaca Newcomers Club to offer get-togethers and advice for its members and newcomers to the city. Services for foreign residents include a large network of English-speaking doctors, foreign mass media via satellite, and ATMs networked to U.S. banks. Cuernavaca also has attracted Hollywood production with parts of the 1969 Western film Butch Cassidy and the Sundance Kid being shot in the countryside south of the city, and parts of the classic 1979 comedy The In-Laws, starring Alan Arkin and Peter Falk, being filmed there. In 1984, John Huston shot there Under the Volcano from Malcolm Lowry's novel, with Albert Finney and Jacqueline Bisset. The municipality is located between the Trans-Mexican Volcanic Belt in the north and the Sierra Madre del Sur in the south, in a sub-mountain range named the Sierra del Chichinautzin. The municipality contains an area of 151.2 square kilometres (58.4 square miles); 5,668 hectares (14,010 acres) is dedicated to agriculture, 8,227 ha (20,330 acres) for fishing, 5,400 ha (13,000 acres) is developed, and 1,390 ha (3,400 acres) is forest. The average altitude is 2,200 metres (7,200 feet) above sea level, varying between 1,255 and 2,355 metres (4,117 and 7,726 feet). The highest elevations are in the east and north. The municipality is located in the Amacuzac Basin. Major rivers there include the Ixtapan, Apatlaco, Yautepec, el Pollo, and Chapultepec. There also are a number of small streams and fresh-water springs. Most of the economic activity in the municipality is retail trade, concentrated in and around the city of Cuernavaca. Agriculture and fish farming employ the least number of people, although the municipality contains a good quantity of resources for these enterprises. The far north of the municipality generally is not suited to agriculture, due to the terrain and types of volcanic soil found there. Most agriculture is concentrated in the southeast. The lower elevations, at around 1,800 metres (5,900 feet), is best-suited for fishing and fish-farming. The middle range, between 1,800 and 2,100 metres (5,900 and 6,900 feet), has uses mixed between agriculture and forest products, and the elevations higher than 2,100 metres (6,900 feet) are primarily forest. Fish farming areas are under pressure from urban development, especially in the Ahuatepec region east of the city, where irregular and sometimes illegal, housing developments are appearing among the farms. The Campus Cuernavaca of the Colegio Suizo de México is in Cuernavaca. The Cuernavaca Campus of Colegio Olinca is also in the city. The Lycée Franco-Mexicain (Liceo Franco Mexicano) has a branch campus, the Escuela Molière/École Molière, in Ocotepec. The city is the setting for Malcolm Lowry's Under the Volcano. It is also the setting for John D. MacDonald's novel Please Write For Details.